MRW brings you news from around the globe. 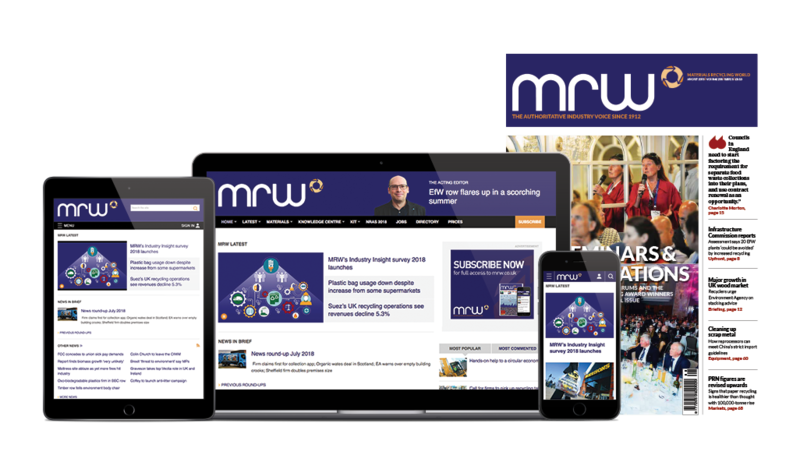 We gather top international markets, business and policy news that affects the UK industry. The Long Island Power Authority has reached a deal to buy almost $1bn of electricity over 15 years from four energy-from-waste plants on Long Island, including three owned by Covanta. The authority will pay $989m for electricity produced by the waste-to-energy plants. The bulk of that, or about $929m, is to buy power produced by Covanta through an initial five-year term followed by two five-year extensions. The Can Manufacturers Institute (CMI) has reported that more than 4.5m metal cans were collected for recycling by schools that took part in the association’s national recycling competition. The CMI is a national association of the metal can manufacturing industry. Its members operate close to 150 plants in 36 states. More than 790 schools participated in the Second Annual Great American Can Roundup, raising more than $100,000 for school activities and local charities. The programme runs from 15 November (America Recycles Day) to 22 April (Earth Day). Green Energy Solution Industries (GESI) has announced that it is close to finalising the provision of up to $45m dollars to fund its renewable energy project in Alberta, Canada. GESI is conducting due diligence and compliance for the provision of all funds necessary to carry out its project development of a 200-ton-per-day energy production facility. Latin America’s largest rubbish dump is to close, costing thousands of local people their jobs. The Jardim Gramacho landfill in Rio de Janeiro, Brazil, gained worldwide attention two years ago when it featured in the Oscar-nominated documentary Waste Land. Thousands of local people earned a living by sorting through the rubbish for recycling. But the site is being closed for environmental reasons, after toxic waste started leaking into the sea. A community recycling enterprise in Kenya has won an international award. The United Nations Seed Award Winners 2011 was awarded to Watamu Community Solid Waste Management and Recycling Enterprises for its achievement in innovation and entrepreneurship skills in the community. The award, at a ceremony in South Africa, follows the successful co-operation between Watamu community oganisations and the local marine tourism industry in creating a plastic recycling value chain, making use of the waste to generate income and create a pollution free environment. A recycling plant owned by the Lagos State Government at the Olusosun Landfill site in the Ojota area of the state has commenced full capacity operation with several odour neutralizers and mobile atomisers installed to douse the poignant odour oozing from the site, especially when it rains. A Ghanaian deputy minister of Local Government and Rural Development has said the practice of collecting waste and disposing of it at a dumping site is not the best for the African continent. Elvis Afriyie Ankrah said the adoption of modern waste management practices should be the sole priority of players in the sanitation industry. Kaduna State commissioner for environment and natural resources Zakariya Shamaki has announced that the Federal Government has completed the construction of a plastic recycling plant in the state. Shamaki said at machinary needed for the plant to function was on the ground awaiting installation. An innovative Australian company that has established a recycling service for ‘absorbent hygiene products’, including incontinence products from aged care services, has won a major international business award. Federal opposition Leader Tony Abbott has said that hundreds of workers at an aluminium smelter in the Hunter Valley are among the first victims of the carbon tax. More than 300 jobs are set to be lost when Norwegian company Norsk Hydro shuts down its Kurri Kurri plant. A proposed cash-for-containers bill could threaten household recycling collections, according to campaigners. Greens MP Cate Faehrmann and Independent Clover Moore plan to introduce a co-sponsored bill that will see containers and cans receive 10 cents on return to depots. Despite frequent reports of rising demand for handouts at food banks, Hong Kong’s four supermarket chains are throwing out 29 tonnes of edible food a day, according to a study by a local green group. The discarded food was enough to feed 48,000 three-person families, said one food bank manager. ParknShop and Wellcome both said they offered discounts on foods nearing their expiry date and would return any expired food to suppliers to reduce waste. CR Vanguard said it would consider donating food if practical; Jusco said one of the company’s branches was already recycling unsold food products. Showa Denko KK (SDK) and its affiliated companies, headquartered in Tokyo, have announced that they have collected for recycling about 6 million used beverage cans in 2011. The city authorities in Beijing have initiated a special ‘scrapping bonus’ for old vehicles and those fuelled by heavy diesel, with the aim of improving air quality. China’s official press agency, Xinhua, reports that Beijing residents will receive from US$397 to US$2300 under the new subsidy for each eligible car they hand over. Bollywood stars Akshay Kumar and Sonakshi Sinha attended the ‘Keep Your City Clean & Green’ initiative held in Faridabad by Hanjer Biotech Energies to make citizens aware of disposing of waste responsibly for a cleaner and greener city prior to World Environment Day (June 5). A combined heat and power plant run on incinerated municipal solid waste (MSW) will be created in Krasnodar in Russia over the next few years, the territory’s vice-governor Vadim Lukoyanov has said. A territorial program for MSW recycling has been developed in Krasnodar, which involves building 11 landfills in the territory. All of these landfills will comply with the established legislative norms in terms of environmental safety. National glass associations across Europe and Turkey have joined forces to create a new alliance to work on climate change and sustainability issues. A total of 13 national glass associations will form a new organisation entitled Glass Alliance Europe. It includes organisations such as the British Glass Manufacturers’ Confederation, Feve and GlassFibreEurope. Food waste generated by American scientists researching in Antarctica was incinerated in Spokane over a 10-day period last month. The trash made its way from McMurdo Station to the West Plains via Port Hueneme, Calif.